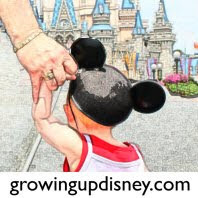 DisneyDad: I have thought many times what I might do if I could work at Walt Disney World. My children have told me I should work for DVC talking to people about becoming Vacation Club Members as I have talked to many people when I visit the DVC booths in the parks and Downtown Disney and a few of them have become members. While this would be fun, I think the pressure of having to meet a quota of signing up people to tour DVC might be more stress than fun. I think my best job would be as Mayor of Main Street USA. I would love to be able to stand on Main Street and greet all the guests that have come to visit the Magic Kingdom. I think it would be fun to greet the kids and big kids (read adults) coming to see the Magic Kingdom for the first time or the 100th time. It has always been fun seeing someone who has never been to WDW experience the Magic of the Magic Kingdom for the first time. It would be fun to work where you could see that every day. On the days when I’m not acting Mayor, I’d like to walk around with a broom and dustpan to pick up around the Magic Kingdom talking to a few guests while keeping the park clean. But, since my back hurts after walking for long periods of time, instead I’d love to drive one of the steam engines around the Magic Kingdom. I’d love to be able to blow the whistle. I think the “all aboard” is recorded, so I’d just have to blow the whistle and wave. Amy: I have been a Cast Member before. I worked at The Crystal Palace as a seater during College Program. It was fun but I wouldn’t choose it again, especially not in a hypothetical situation where the sky is the limit. I can’t sing or act but if I could, I would want to be a part of the Citizens of Main Street that perform in the morning at the Magic Kingdom. I have been pulled into their show before and was glad I knew “Sister Suffragette” from Mary Poppins. I love all the smaller “impromptu” acts around Walt Disney World and each park has multiple examples. Streetmosphere and Mulch, Sweat, and Shears at Disney’s Hollywood Studios, DeVine at Disney’s Animal Kingdom, The Jammitors at Epcot, and The Dapper Dans of the Magic Kingdom are a few favorites of mine. Ridge: If I were a cast member working in the parks I would like be to 1) a Jungle Cruise captain or 2) a safari guide at Kilimanjaro Safaris. Reason being is that I love both of these attractions and as my friends, family, former teachers, co-workers, and annoyed trivia teams from all over can attest, I have a head full of useless and I hope entertaining information (Donald Rumsfeld ..my brother-in-law still hates me for that one.) I am a fan of the Jungle Cruise because it is delightfully tacky and with the right cruise director a boat load of laughs. I like the first couple of hours in the morning for the fresh tours or the end of the day because not only is the jungle cruise really cool at night, the captains are sometimes a little punchy and the delivery gets a little more risqué and passenger participation also seems to go up. As for the Safari, this is where my useless knowledge would come in handy, also I like driving, talking and animals so winner, winner chicken dinner! What job would you like to have at a Disney park? Hands down working the Stunt Show at DHS. Why I don't think I would want to be the man who catches on fire we are already planning on how we can schlep a baby up into the stands more than once next month. A 2nd would be working It's a Small World. I never get tired of a classic. lol My family always has this conversation every time we go to WDW! 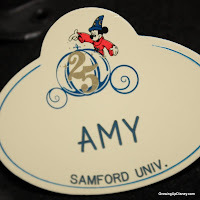 Here's what we've decided: my husband would work at the Haunted Mansion, our son would be the one that "turns on" the water slides at the water parks(if there is such a thing haha) and I would work in restaurant reservations! I also wouldn't mind being a princess but my husband tells me I already am one! ha. ha.